I’m not going to look at safeties much because there hasn’t really been any rotation there and there aren’t many stats to quantify safety play (though I will say I feel good about my preseason pick of Eddie Jackson as the defense’s breakout star). Let’s jump right to the CBs then and take a detailed look at their performance using stats from The Quant Edge. The first thing I want to note is that Chicago’s corners don’t move. Kyle Fuller has played exclusively on the right side (from the offense’s perspective) and Prince Amukamara has been exclusively on the left. Kevin Toliver II basically took Prince’s spot on the left post-injury, though he did play a few snaps in the slot. Nickel CB Bryce Callahan, meanwhile, played a few snaps outside after Prince got hurt but otherwise has been exclusively in the slot. Next I want to look at how effective each CB has been in coverage, as well as how much man, zone, and press coverage they’ve played. At first glance it might seem like Kyle Fuller has been the worst CB on the roster, but look beyond the passer rating. That takes a big hit because he’s given up 2 passing TDs and none of the throws targeted at him have resulted in interceptions yet. He’s been very good at keeping the completion percentage down, and the yards per target on throws aimed at him are much lower than anybody else. Make no mistake: he is the best CB on Chicago’s roster, and he is very good. Fuller is actually the only CB credited with giving up a TD so far this year. He gave up two, which means the other 5 passing TDs the Bears have allowed are blamed on non-CBs. Meanwhile, five passes targeted at CBs have ended up intercepted. That’s a great ratio. I find the press splits interesting. Toliver has never played press, and Fuller only does it about half as much as Prince and Callahan. That’s perfectly fine; each player has their own style that is obviously working well for them so far. Chicago’s defense has been awesome in the first month of the season. They’re among the best in the league in nearly every category that matters, and are ranked first overall in DVOA. Now I want to look a little more closely at how well they’re performing against both the run and pass in different areas of the field. Chicago’s run defense was solid in 2017, but it has been fantastic so far in 2018. They have shut opposing run games down, and they’ve done it pretty much across the board, as we can see below. Here’s the data for Chicago’s rushing defense by zone, courtesy of the NFL Game Statistics and Information System. The line at the bottom is the line of scrimmage, runs are split into 7 zones, and attempts and yards per carry are listed for each zone, with ranks relative to the rest of the NFL in parentheses. 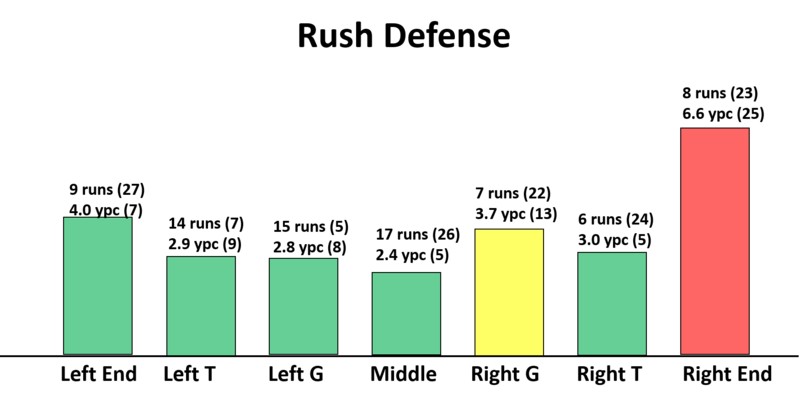 The height of the bar is proportional to yards per carry, and bars are colored green for top 10, red for bottom 10, and yellow for middle 12. Note expected yards per carry varies by region, so the colors are relative to their peers in that region. That’s a whole lot of green. Awesome. Last year’s version featured a lot more yellow and red. This is a good time to remind you that Khalil Mack is an elite run defender in addition to being one of the best pass rushers in the league. Speaking of Khalil Mack, he and Akiem Hicks usually line up opposite the RG and RT. Notice where defenses are running towards? There are 38 runs to the left side – away from Mack and Hicks -compared to 21 towards them on the right. Bears at the Bye: Pass Catchers! Everywhere! Pass Catchers! Now that we’ve seen Chicago’s new offense play four games, it’s time to examine what exactly it looks like. We’ve seen them run 271 plays, and while that’s still a fairly small sample size, it’s big enough that we can begin to pick up trends, search for predictable patterns that opposing defenses might begin to pick up on, and see if there are any situations their current approach could be improved. Now we focus on the wide receivers and tight ends, examining how much they’re playing, how effective they’ve been, and how they’re being utilized. First I want to look at how frequently each target is playing, and how their presence on the field impacts the offense’s performance. Data is from The Quant Edge. I’m using success rate here instead of yards per play. That is to account for down and distance context. A two-yard play on 1st and 10 is bad, while a two-yard play on 3rd and 1 is good. The general idea is that a successful play keeps you ahead of the chains, but an exact definition is available here if you’re curious. I didn’t include Allen Robinson, Taylor Gabriel, or Trey Burton here because they’re almost always on the field; they’re all playing least 83% of the offensive snaps so far. This is more to look at the players who are situational and how they’re impacting the offense. Anthony Miller’s data only includes the 3 games for which he was active. On the surface, it looks like Anthony Miller has hurt the offense. Maybe he has. But he basically only plays in 11 personnel groupings, where there are 1 RB, 1 TE, and 3 WRs on the field, and in general that grouping has been the least efficient passing formation in the NFL. In terms of the run game, I don’t actually know much about Miller as a blocker. It’s possible that he’s not blocking well and that’s hurting the run game, but it’s also possible something else is causing the difference. Today we’re going to focus on running backs Jordan Howard and Tarik Cohen, examining how much they’re playing, how effective they’ve been, and how they’re being utilized. First I want to look at how frequently each running back is playing, and how their presence on the field impacts the offense’s performance. Data is from The Quant Edge. Howard is actually playing typical lead RB snaps for an Andy Reid offense. As I noted this offseason, Kareem Hunt played 65% of the snaps in Kansas City last year. This is in stark contrast to the Philadelphia Eagles style-rotation I thought would make more sense. It’s worth noting the 2 split snaps almost exactly 50/50 in the Tampa Bay game. I wonder if that’s more what we’ll see going forward. The run/pass splits for when both of these players are in vs. out of the game are too lopsided. A 30% swing when Howard exits the game and 20% swing when Cohen enters the game should not be the case. This is too predictable and makes it too easy on the defense. Some of these numbers are related, since Howard and Cohen basically swap being on the field. They’ve only shared the field on 23 snaps so far this year, so the run game being more effective with Howard off the field is the same as saying the run game gets more effective when Cohen is on the field. Again, I think this might have more to do with defenses gearing up to stop the run when Howard is in the game and not expecting it when Cohen is in. Now that we’ve seen Mitchell Trubisky play four games under Matt Nagy’s tutelage, it’s time to examine how he’s doing. We’ve seen him play 269 snaps and throw 130 passes, and while that’s still a fairly small sample size, it’s big enough that we can begin to analyze how he’s performing in a variety of situations. Last offseason I looked at Trubisky’s performance in 4-game snapshots, borrowing the idea of breaking an NFL season down into quarters from Lovie Smith. There I found that Trubisky got progressively better in every “quarter.” Since Trubisky has played 4 games this year, he now has 16 in his career, giving him a full 4 “quarters” that we can track. Let’s take a look. Well that looks pretty good. I said last offseason that, statistically speaking, Trubisky needed to throw more TDs while keeping everything else the same. Here we see that he has managed to throw more TDs, and everything else has stayed the same or improved. That’s good growth to see from a 2nd year QB. Of course, four games is a small sample size, and this doesn’t look quite as rosy if we remove the Tampa game from the equation. Then his yards per attempt drops to 5.7, TD percentage to 1.9%, and his INT % (2.9%) and sack % (8.0%) both rise a bit higher than they were late in his rookie year. Through three weeks, the stats suggested Trubisky was actually playing worse than late in his rookie year. That’s not entirely surprising given that learning a new offense often results in a step back at first. Adding the TB game in there makes this look good, but now the question is whether the TB game was an aberration or a sign of things to come. Let’s start by looking at what they’re doing in different down and distance situations. 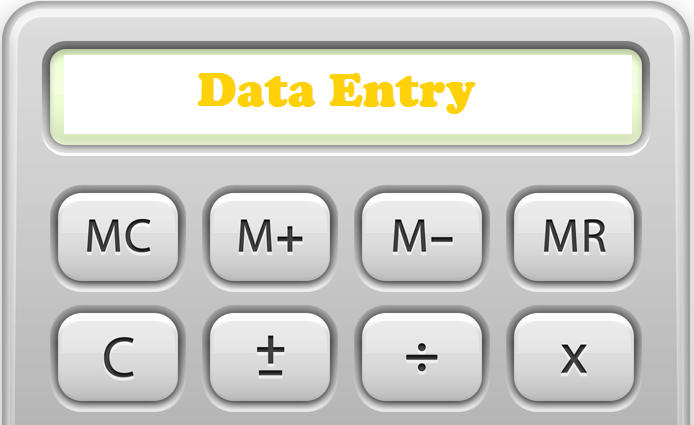 All statistics come from the NFL Game Statistics and Information System unless otherwise noted. The offense has been extremely balanced on 1st down so far, with exactly 58 runs and 58 passing plays (passes, sacks, or scrambles). The passing game has thrived with an average of 7.8 yards per play. According to Pro Football Reference’s Game Play Finder, Mitchell Trubisky is completing 69% of his passes on 1st down, with 6 TD, 2 INT, and a 115.9 passer rating. The running game, on the other hand, has been extremely ineffective, averaging only 3.0 yards per carry. Most of the running attempts (34) have come from Jordan Howard, who is averaging 3.2 yards per carry, but Tarik Cohen also has 17 carries at only 2.9 yards per clip. It would appear the Bears are either making it obvious when they’re going to run or defenses are worrying about stopping the run first to make Trubisky beat them. When it comes to 2nd down, context is needed. A 3 yard gain is great on 2nd and 2, pretty good on 2nd and 5, and awful on 2nd and 10. With that in mind, I split the data into 4 groups based on the distance required to get a 1st down. The table below shows the results.